Cast: Katherine Heigl, James Marsden, Edward Burns, Judy Greer, Malin Akerman. Story: 27 times a bridesmaid, never a bride. Ho hummity hum. Not really one for Forwardcharm readers, this one, but quietly amiable nonetheless. Katherine Heigl (Grey's Anatomy, Knocked Up) stars as the bridesmaid of 27 weddings, wondering if her day is ever going to come, all the while pining over her rugged boss Edward Burns. Can anyone tell where this is going, readers? 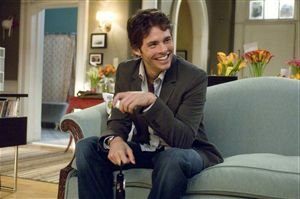 Well, it's not quite as cut and dried as that, because cheeky rascal James Marsden, fresh from rescuing the fairy princess in Enchanted, lands in the middle of everything as another likeable potential suitor - and then Heigl's sister Malin Akerman sweeps in, offering her womanly juices to anyone with a wallet. Clearly the stage is set for Miss Heigl to trade rings with one of the handsome princes, but which way is it going to go ... can you stand the suspense? Well yes, I suspect you can. I certainly could. Although everything is very pleasant indeed and Katherine Heigl is perfectly cast in the lead, it's difficult to give a monkey's about what's going on. You have to give some credit to director Anne Fletcher though - she does well stepping up from .. er .. "Step Up", her last directorial role. You'd never guess she's more used to being a choreographer - though perhaps this inexperience is the reason nothing really punches you - it's rather fluffy and protective. You know there are no nasty surprises coming; I half-expected to see the Disney name in the credits. 27 Dresses is most definitely one for the ladies. You won't find anything you haven't seen a dozen times before, but sometimes that's the perfect accompaniment to a bottle of Beaujolais and a box of Milk Tray in front of the fire. Testosterone Satisfaction Rating: 0/5 - Katherine spends the entire movie changing her clothes but always out of shot. To enjoy this film you should be: a chick up for a flick. 27 Dresses was released in the UK on 27th March 2008.